In August 1660, an Englishman named William Harrison, estate manager to Baptist Hicks, set off on foot for the village of Charingworth (about two miles away) in order to collect rent owed to his master. He never arrived back! His manservant and son set out to find him, but Harrison's bloodstained hat, shirt, and collar were soon discovered on the main road between Chipping Campden and the village of Ebrington. There was no body. In the furor that followed, the manservant accused his own mother and brother of killing Harrison for his money. He convinced the jury by acknowledging that the idea had been his own, and thus he was putting himself in jeopardy by admitting it. Why would he lie about such a thing? All three were hanged in 1661, but here's the rub: In 1662, Harrison reappeared. He said he'd been abducted by pirates, sold into slavery, and escaped. So why did the manservant lie, bringing a death sentence on himself and his family? It's never been explained. Of the many mysteries of the Cotswolds nothing can be more enigmatic than the events in that occurred in 1660 and became known as “ The Campden Wonder”. It was in the August of that year that William Harrrison the Estate manager for Sir Baptist Hicks (some say for Lady Juliana Campden, daughter of Baptist Hicks) failed to return home after setting out on a journey to Charingworth, for the purpose of collecting rents for his employer. As he had not returned before darkness fell and his wife was getting increasingly anxious, William Harrison’s manservant, John Perry, was instructed to search for him, and as he also did not return the same night Harrison’s son was sent to see what had happened. During his journey he met up with John Perry, who was by then returning, they joined forces and called at the nearby village of Ebrington in order to make further enquiries. It was here that they were informed that William Harrison had called the previous evening on his return journey from Charingworth. John Perry and Harrison junior then made enquiries at neighbouring Paxford village without avail, so they then set out back to Chipping Campden and it was during this journey that they discovered a hat and a shirt collar soaked in blood. Immediately upon their arrival at Chipping Campden a 'hue and cry' was raised and an extensive search was made by the Townspeople but William Harrison was nowhere to be found. A rumour started that John Perry was responsible for his master’s absence and that he had killed him. He was taken in for questioning and was remanded in custody at Campden and it was whilst he was being held that Perry declared that he had information that he would disclose. This prompted closer interrogation and he then declared that he was not responsible in the murder of William Harrison but his brother and his mother were and that they had killed and robbed him for the rents that he had collected. Perry’s mother, Joan Perry, and his brother Richard Perry, were arrested and tried twice (no conviction the first time due to no body being found) along with John Perry and were eventually all found guilty of murder. 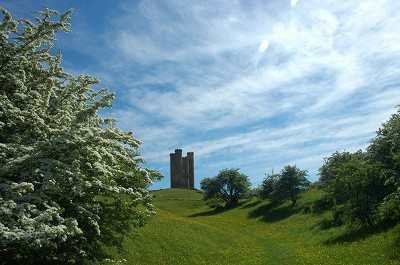 They were hung at Broadway Hill which overlooks Chipping Campden, first to be hung was Joan Perry whom it was thought to have been a witch and had persuaded her sons to commit the crime, second was Richard and lastly John. Imagine the amazement when some two years later William Harrrison returned to Chipping Campden, he stated that he had been kidnapped by three men on horseback who were dressed in white and that he was taken by ship from Deal In Kent to Turkey and held against his will for two years and that he had escaped to return to England. In 1662, Harrison returned to England aboard a ship from Lisbon, bearing a remarkable story. He claimed to have been abducted from England by pirates and taken abroad; then taken onto a Turkish ship and sold into slavery near Smyrna. After about a year and three quarters, Harrison said, his master died; then he went to a port and stowed away on a Portuguese ship, finally returning to Dover by way of Lisbon. Whether or not Harrison's marvelous tale was in fact true, it certainly disproved John Perry's claims that he had been murdered in August 1660, and thus posed a mystery: with what motive could Perry have made up such a claim? The whole record of these incredible events became known as the “Campden Wonder”. There has been several different versions of the story relating to 'The Campden Wonder'. The most accurate account of the Campden Wonder is believed to have bee published in 1663 by Sir Thomas Overbury (died 1684; nephew to the more famous knight of the same name). John Masefield wrote two plays on the subject: The Campden Wonder and Mrs Harrison. The latter dealt with the popular myth that Harrison's wife had committed suicide on learning that her husband was alive; in reality, little is known about Mrs. Harrison – she may even have been dead before 1660, and the "Mrs. Harrison" of Overbury's account was the wife of William Harrison's son Edward. This case, along with the Sandyford murder case, was mentioned in E.C. Bentley's 1920 detective story Trent's Last Case, and provided some of the inspiration for that novel's plot. Sir Baptist Hicks once Mayor of London, First Lord Campden and a friend of the Royalty He lent money to James I and as a result acquired some considerable wealth. He was also a friend of Charles I. At the time of the Civil war his own house (Campden Manor) was burnt down rather than allow it to fall into the hands of the Parliamentary forces. A philanthropist, he was responsible for many of the fine buildings in Campden including the Famed Wool Market Hall, which is known the world over. He was also responsible for the erection of the Almshouses, his generosity to the town was almost without bounds. His Tomb is at the Church of St James, Chipping Campden, The South Chapel contains effigies of him and his wife. For more information on Sir Baptist Hicks.